Andres Iniesta is on the verge of signing for Vissel Kobe after sharing a snap of himself flying to Tokyo. The Barcelona legend ended his 22-year stint at the club on Sunday and is expected to officially announce his move to Japan on Thursday. 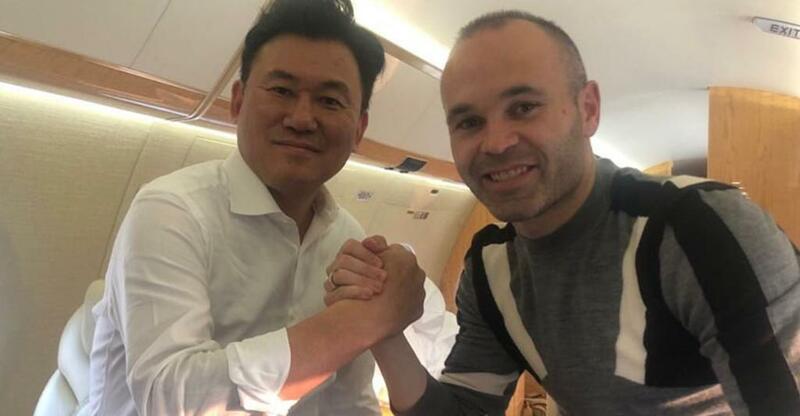 The 34-year-old posted a picture of him on social media with Vissel owner Hiroshi Mikitani – who is also CEO of Barca’s sponsors Rakuten – inside a jet. He wrote: “Heading to my new home with my friend”. Leaving little doubt as to where he was going, Iniesta posted an emoji of the Japanese flag for good measure. He will now play under fellow World Cup winner and Arsenal cult hero Lukas Podolski, who skippers the J-League outfit after joining last year.